[Category]: Nail jewelry. [Unit of goods]: box. We assure you will get the item as described, on the best conditions, and more important on the best price in the market. A gorgeous set of 9 mini Miss Cutie Pie Nail Varnish, in a selection of stunning, vibrant colours. A selection of bright colours including, pinks, blues, reds, purples and more. Product Information: Miss Cutie Pie Set of 9 Mini nail varnishes Developed in Britain Each: 4.5ml. Apply the no wipe top coat. Cure under a UV light for 2 minute or an LED light for 30 seconds. (Kindly Remider: when you want to apply the holo rainbow effect powder, you'd better cure under a UV light for only 10s to achieve a better effect.). TRIXES 6 Empty Heart Shaped Nail Varnish Bottles. 6 x Empty Heart Shaped Nail Varnish Bottles. Heart shaped glass bottles. Brush integrated in cap. MP3 MP4 Players. Kindle Accessories. iPod Accessories. Use this powder to create the shining mirror effect for your nails. Pop Up Playtent Teddy Hammock Wizard/Princes Castle. Apply the no wipe top coat. Cure under a UV light for 2 minute or an LED light for 30 seconds. EVELINE Maximum Nails Growth Quickener 12ml. Professional, ultra-intensive program for daily nail therapy ensuring effective strengthening and maximum nail plate growth. The formula enriched with silk proteins, which in a precise way strengthen and seal the nail plate. 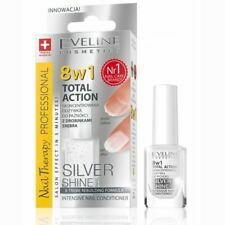 You can also use this nail armor nail gel as a base or protective top coat. This nail gel leaves behind a glossy finish with an attractive shine. Get strong, beautiful nails faster and easier than ever before with Pink Armor Nail Gel! PROFESSIONAL EVELINE SOS BRITTLE AND BROKEN NAILS 12 ml. Prevents tearing, cracking and excess growth of cuticles. Apply the gel around the cuticles and leave for 30 seconds, then gently push back cuticles with a wooden manicure stick. Contains avocado oil, which calms, smooths and intensively hydrates cuticles. Luxury silver hardening conditioner with active Strong Nail complex penetrates into nail plate structure, rebuilds, regenerates and stimulates nail growth. We are always happy to help. 1 litre bottle of Acetone available at low price. Ideal for removing nail varnish and extensions. Often used for removal of hair extensions. THIS IS PURE ACETONE. 1 Litre Nail Varnish / Tip Extension Remover. Stimulates the growth of nail plate. Active strong nail complex. We are always happy to help. 100% Brand New! Free Postage ! Stimulates the growth of nail plate. Active strong nail complex.